One of our customers sent us a flash drive that had been worked on by someone else. The first thing we noticed was that one of the pins on the NAND chip was missing. 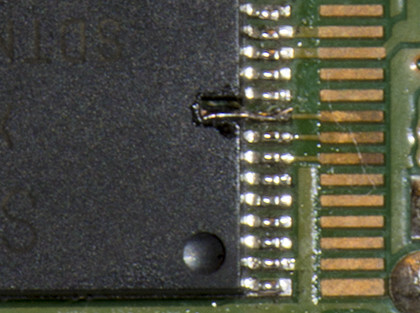 Luckily we’re able to repair this type of damage by removing the thermoset around the broken pin and soldering a thin wire inside the chip where the pin broke off.